Many of you seem to appreciate that I share the unvarnished truth about my modeling. I thank you for that. The mainstream paints everything in nice rosy colors that lead one to believe that a model just falls together by itself. To admit that one screwed up is apparently a cardinal sin and if you’re struggling, you’re doing something wrong. I’ve spent the bulk of my adult life pursuing some form of creative work and I assure you that nothing is further from the truth. Even the most accomplished and skilled professionals admit to self-doubt and many false starts in the course of their work. It simply comes with the territory. Sharp-eyed readers will see the obvious in the photos: I’ve rebuilt the walls for the Hoosier Drill Co. for a third time. This time there was no debating, no second-guessing myself, no what-if. Every project is a classroom for me, where I figure out what works and what doesn’t. Most of the time I have no idea what I’m doing and the work often reflects that fumbling around quality. In fussing around with the materials, I’ll often find a better technique or simpler way to produce the results I want. In this case the choice to start over came when I realized another series of errors were beginning to pile up once again. I was tempted to let them slide but it irritates me how quickly and easily this lazy attitude presents itself. Much, if not all, of the frustration I experience with this work is from hubris, that toxic combination of ego and pride that leads me to think I know more than I do and can cover up my shortcomings. For all that I’ve written about the mental aspects of modeling you’d think I’d know better. Clearly, I still have much to learn. Another collection of errors led me to remake the wall sections again (above). 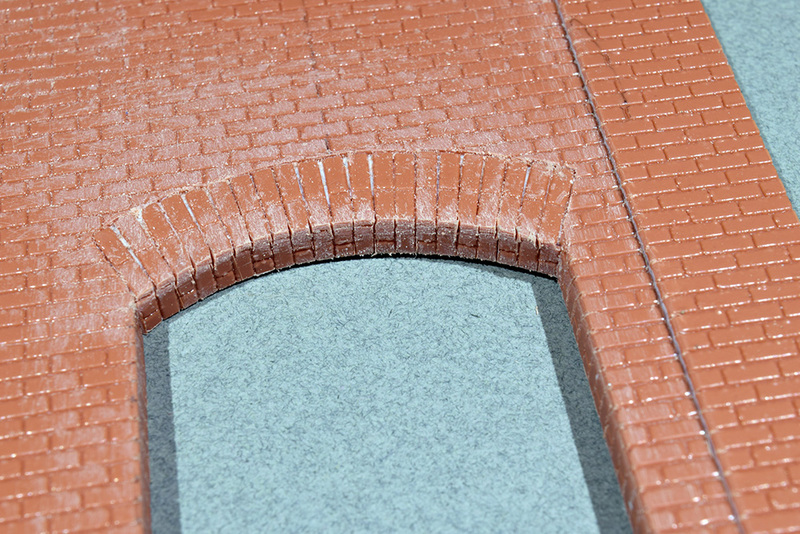 Because this is a foreground model, carefully matching the brick pattern, aligning the course lines and carrying the mortor joints around each corner all make a difference in appearance of the finished model (below). By grace this time, my indecisive waffling didn’t happen because I had left out the basement windows, a signature feature that needed to be there. I also realized that the wall wasn’t tall enough, which impacted the third floor windows and shortchanged the space above them. These two oversights, plus my lack of enthusiasm for the window sash of version two cemented the choice to start over. It was in fact, an easy decision because I’ve finally learned not to view this as a setback or wasted time. Instead, I see it as another step on the path to modeling the way I want. This rebuild is going well since I learned the steps and sequences needed from the previous attempts. Little time has been lost and in fact, I’ve also rebuilt the other wall for this building that faces North E Street. 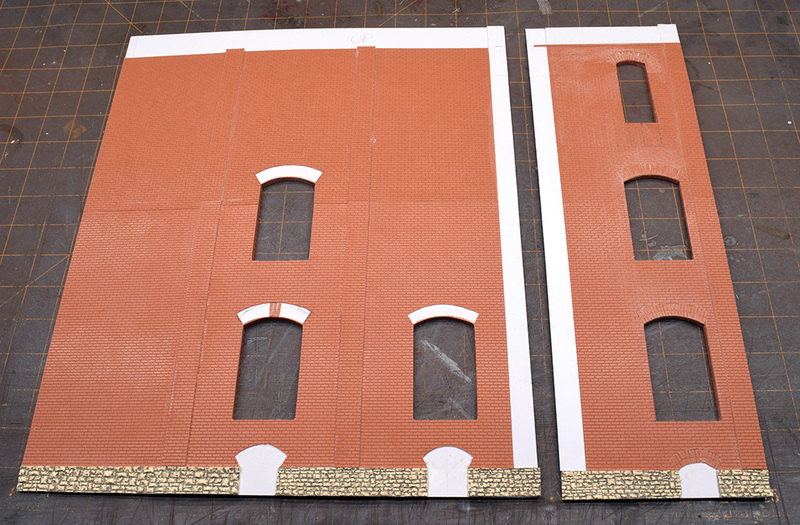 Before joining the two walls into the L-shaped building, I need to determine how the pilaster and brick pattern will wrap around the outside corner. I’ve done the layout for that but I want to complete as much of the finer detailing as possible while the walls are still flat on the bench. Assembling the structure will be one of the last steps I do before installation. The work is much cleaner and more satisfying because I have more confidence in executing it. The previous builds taught me where the mistakes happened and more importantly, how to avoid them in the first place. For future reference, I’ve documented the procedure and materials used in a small notebook I keep at the bench. This information will come in handy since I’m not done with city modeling. Like many artists, I believe an object has its own intrinsic qualities: things like a particular shape, proportion, color and patina that distinguish one object from another. Paying attention to these qualities strengthens the images we create and the same applies to model making. David Goldfinch, a friend of the blog in the UK, kindly sent me some of his photos of Peter Johnson’s Canada Street layout. 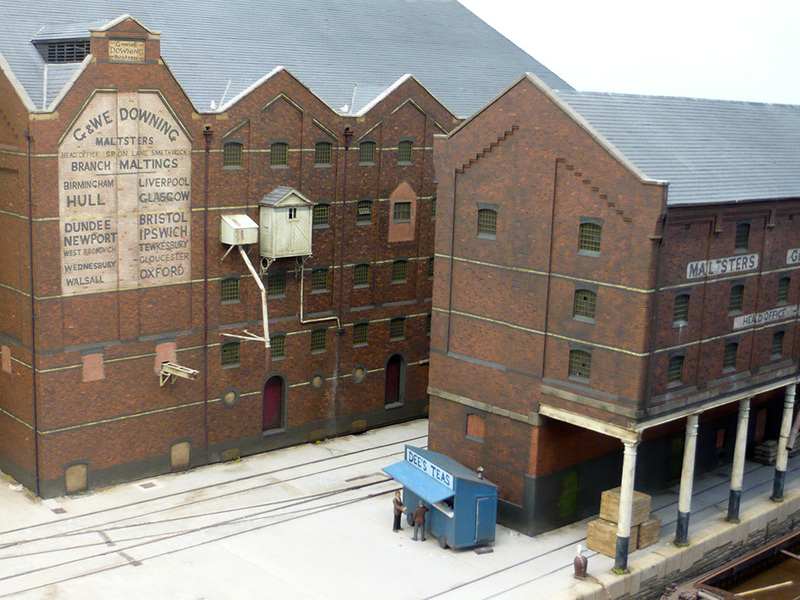 Peter described the construction of the Downing Malting warehouse (the two large brick colored structures) in MRJ 245 and I’ve returned to his article often during this project. However, seeing these models from a fresh perspective only heightens my appreciation of Peter’s work. I’m especially drawn to all the subtle details of the brickwork that weren’t shown in the magazine. 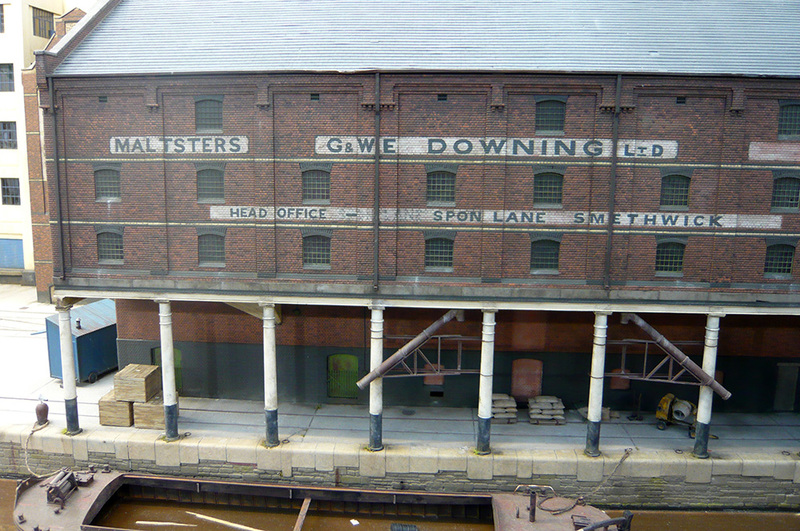 The stepped layers and small corbels of the dockside building add so much to the character of it. Without them, the model would be less than it is. Details like this don’t happen by magic or chance. It requires keen observation and a thoughtful approach to render them so faithfully. These images of Peter Johnson’s Canada Street layout (above) were all provided by David Goldfinch of the UK and used with his permission. 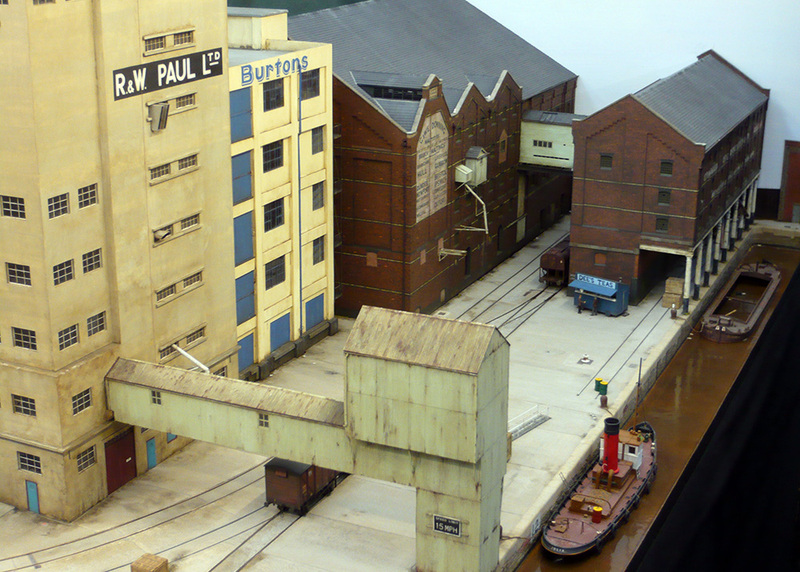 This is about half of the L-shaped layout. Below, this shot shows the location of the Hoosier Drill Company next to 13th Street. You can see how it and the warehouse form the alleyway that screens the entrance hole to staging. The empty window space above the end of the boxcar marks the location of the enclosed connector between the two. The empty loading door space will be boarded up as well. 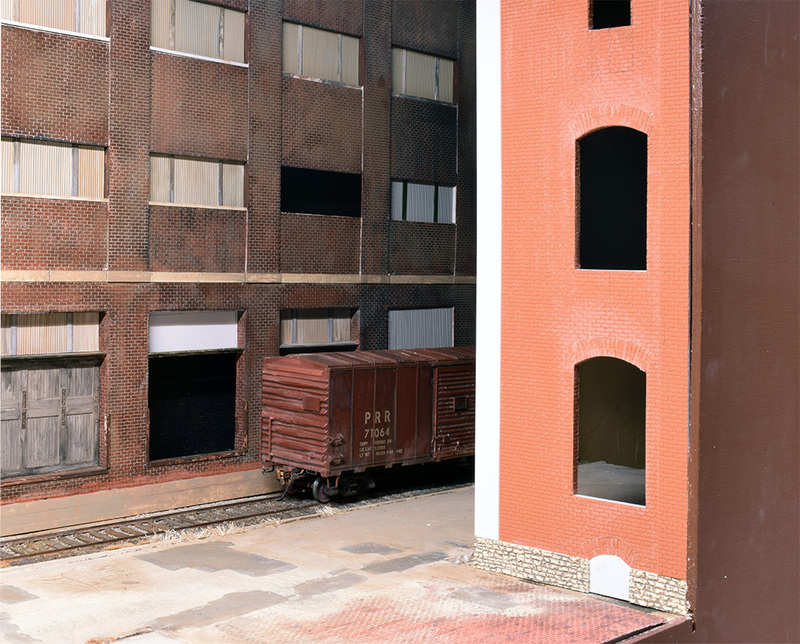 By comparison, my version of the Hoosier Drill Company is a simpler model that contributes to the cameo in a major way even though it’s only a small portion of the scene. I could have taken what many consider the more expedient route of using a generic commercial kit but in the end, that’s all I would have for my trouble: a generic outcome seen on a hundred other layouts. As such an important foreground element, why wouldn’t I exert every effort to capture its character in the modeling and strengthen the inner city setting of the cameo? The opportunity is there; the opportunity is always there every time one sits down at the workbench. Why not take it? So inspirational to see you “scrape down your canvas” and restart. And sharing. In painting I learn a lot about how they got to the end by looking at the artist’s palette and studio. I’d love to see more model articles showing this insight into the modeler’s mind and the journey a model takes from inception to ultimate realization. Thanks for sharing. Peter’s Canada Street captures the essence of the docks in an achievable space. It is a unique rendering through his close understanding of the subject. And the slowed-down operational opportunities, scaled down to the period when the line was dying, make for a layout that literally has it all. And he keeps improving it. Pure inspiration for us all. Thanks for sharing David’s photo, I can’t get enough of his railroad. Your comments on going back to correct errors is very interesting. I’ve had many do-overs on scratch building efforts I’ve had over the years. While some were minor, such as replacing a roof or repainting, some were total start overs. Some folks think this is crazy but I look at each model project as part of a journey. If the path leads in the wrong direction, start over or make corrections. Peter’s Canada Street is very inspiring! Thanks for the comment. If you like the insights into modeling, I think you’ll enjoy the next post. Thank you Peter. I also see modeling as a journey and learning experience. I agree about Canada Street. It’s one of the nicest layouts I’ve seen.